Sighting system includes a PK-AB collimator sight, a laser target designator and a tactical light. 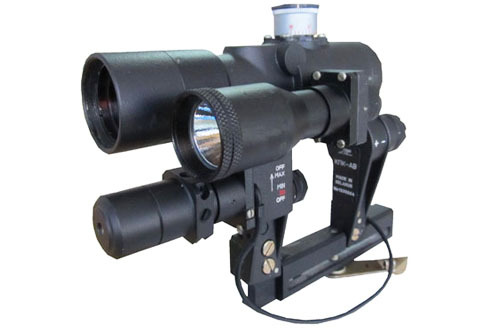 Sighting system allows both accurate shooting at long distances and operative shooting at short distances with the help of a spot of a laser target designator. Tactical light can provide detection and target illumination in low light. At the wish a user can change positions of laser target designator and a tactical light. KPK-AB sighting system is designed for Saiga and Vepr carbines. Sighting system is exposed to loads of 580g when tested on resistance to mechanical shock.